Apple Jelly [Prepare?] twenty golden Pippins: boil them in a pint and a half of water from the spring till quite tender, then strain the liquor through a colander. 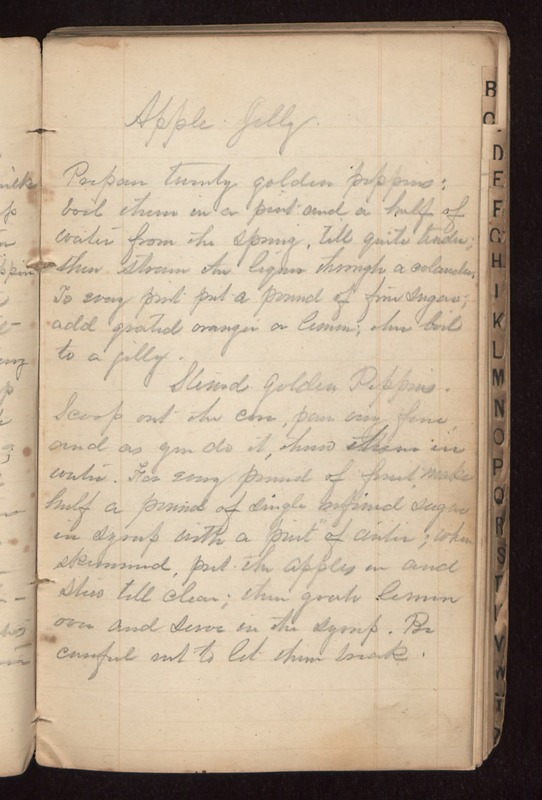 To every pint put a pound of fine sugar; add grated orange or lemon; this boil to a jelly. Stewed Golden Pippins. Scoop out the core, pare very fine and as you do it then steam in water. For every pound of fruit make half a pound of single refined sugar in syrup with a pint of water; when skimmed, put the apples in and [stew?] till clear; then grate lemon over and serve in the syrup. Be careful not to let them break.